This is a once in a lifetime opportunity to own a superior, magnificent, fully restored Monk McQueen Cockpit Motor Yacht. NO EXPENSE WAS SPARED!!! COMPLETE PROFESSIONAL INTERIOR REFIT 2001 & 2006 BOATHOUSE PROTECTED!!! The artwork alone on this vessel will exceed your expectations. Wait till you preview the new modern updated interior throughout this yacht - no other on the market can compare. If your seriously in the market for a Yacht of this caliber you owe it to yourself to preview her in person. If you go through this vessel you will purchase her.......that's right this Monk McQueen is that nice, unique and special!!! CUSTOM BUILT FIBERGLASS 46'TRAWLER DESIGNED AFTER THE CANADIAN FISHERIES PATROL BOATS!!! This vessel was launched in Sidney, BC in 1981. She is modeled after the Canadian Fisheries Patrol Boat "Seal Rock" designed by Vancouver Marine Architect Robert Allen and built in 1959. Boat builder Ove Nielson asked Mr. Allen to provide drawings to build the boat of fiberglass. Ove Nielson, an experience boat builder, built the mold and hired a crew to hand-lay the solid fiberglass hull (in places up to one inch thick) and then completed the house and interior himself. This Nielson Trawler was brought to the US in 1996 and has since been extensively updated and had all systems upgraded. AMAZINGLY CLEAN & WELL MAINTAINED 39' AZIMUT!!! This is a RARE Azimut - Azimut builds primarily large yachts - there are only a few of the 39' Azimut. Make an appointment now to preview this special yacht because once it's sold it's gone. The DEVLIN KINGFISHER 33 features a large cockpit, an economical and efficient cruising speed of 10-12 knots with a top speed of 15 knots, a flybridge for two, easy entry and exit through a generous swim platform, and a 360 degree view from the main cabin. It's powered by a Yanmar 260 HP single diesel linked to a 220 gallon fuel tank. The saloon/pilothouse provides a comfortable dinette for four at just the right height to give everyone a terrific view. The forward dinette seat's back shifts so you can face forward underway or face your traveling companions during a meal at anchor. The captain can relax underway in a Bentley Deluxe upholstered helm seat which is forward of a complete galley. Go below and find a V-berth and enclosed head with sink and vanity. Throughout the workmanship can only come from the very finest craftsmen in this handmade custom boat built in Olympia, Washington. This is an absolutely 'Bristol' condition DEVLIN SURF RUNNER 25 with all maintenance done by Devlin Boat. She is complete with a galvanized tandem axle bunk trailer and full sunbrella winter canvas cover. She cruises smoothly in all waters burning under 4 GPH fuel at 18 knots with a top speed of 23.5 knots. Her maneuverability is unsurpassed with directional thrust due to her composite stern drive, and with duo-prop drive she tracks straight and true She has helm and co-helm seats and plenty of seating for a crowd on those family days. Over the engine is a daybed for sunbathing and she has an interior with finely crafted upholstery and is finished in mahogany trim and white paint for a clean and bright appearing interior. Over 3,500 hours of skilled hand labor went into her construction and every part of "Goose Lodge II" relfects the care and love that only fine craftsmen can impart to their boatbuilding. Built in America with pride and craftsmanship at Devlin Boats!!! The SHEARWATER 25 is a high-efficiency light weight cabin cruiser designed by Bieker Boats in Seattle, WA. Bieker Boats is a leading naval architecture and design office in Seattle responsible for many high-performance cruising and racing boats including major involvement in the last five (5) America's Cups with Oracle Racing!!! The structural philosophy for the boat centers on putting toughness and weight down low where it's needed and keeping higher structure as light as possible. The hull is wood sheathed with fiberglass, kevlar and epoxy. The hull bottom is two layers of 4mm Sapele plywood sandwiching one layer of 6mm Okoume Plywood and the top sides are 14mm thick red cedar strip planking. The deck, house and internal structure are foam-cored vacuum bagged carbon composite. Deck bulkheads and internal structure is 13mm thick Divinycel core. The house top is 25mm thick Divinycel. The composite parts and hull sheathing are laminated with West System Pro-Set Epoxy. Sheer stiffeners and table legs are thin wall carbon tube. 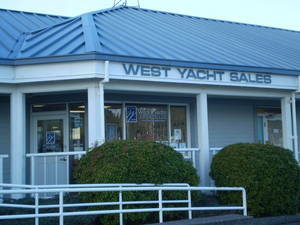 WE ARE EXPERIENCED YACHT BROKERS & BOATERS TOO!!! 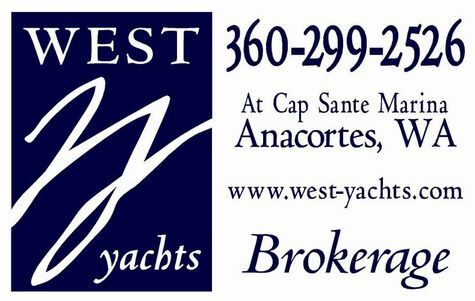 West Yachts Office is located at Cap Sante Marina in Anacortes, WA., on the Waterfront, at the Gateway to the Beautiful San Juan Islands. Stop by West Yachts office and meet all of our highly experienced brokers, check out our variety of different Sail Boat & Power Boat Listings on our full color photo display board in the office. * We can provide you with a FREE Market Analysis on your boat. 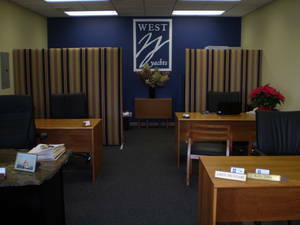 * We can represent clients as a Buyer's Broker. * We can represent clients as a Seller's Agent. * We market your boat on varies web sites & multiple boating magazines. The Tollycraft 40 Tri-Cabin Motor Yacht was the first big yacht ever built by the Tollycraft Company. This Tollycraft has extra-wide sidedecks and a complete lower & upper helm station. Construction is solid fiberglass and the engineering and workmanship are first rate.